This home was built as part of the Shawsheen Village development 1918 – 1924 by William M. Wood, President of the American Woolen Company. Wood hired about eight different architects to design the homes and structures for the village. Homes were sold or rented through the Homestead Association who had offices in the Post Office building on the corner of North Main & Poor Streets. After the death of William M. Wood in Feb. 1926 most of the residential and commercial buildings were then sold. Some were held by the Wood family in the "Arden Trust" and others with the American Woolen Company, which had been deeded the property in December 1920. The A.W.Co. Board of Directors authorized its President, Lionel J. Noah, to deliver all deeds, as deemed necessary to the Textile Realty for sale on Dec. 29, 1931. This house was sold to Paul M. & Elizabeth C. Rice on Oct. 21, 1933. Paul Mosley Rice was a wool buyer for the A. W. Co. in the Boston office. 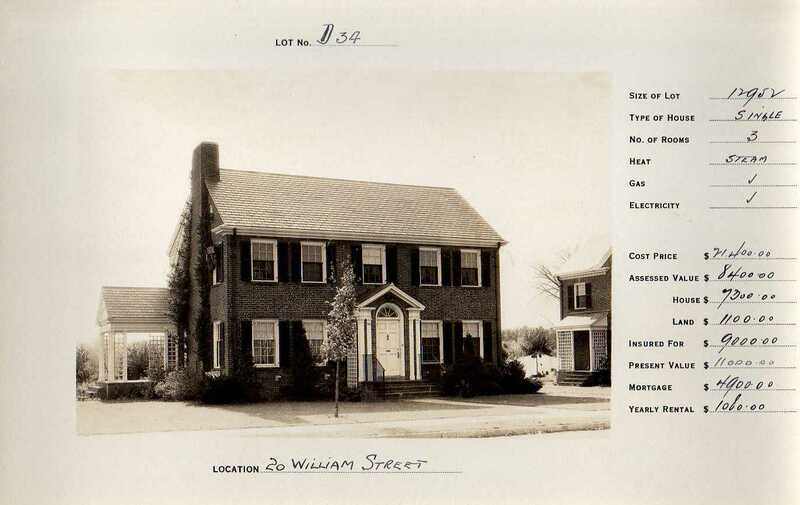 Paul & Elizabeth had been renting the home directly across the street #19 William St. since 1923. The deed was placed in Elizabeth's name on Nov. 19, 1935. Paul was born in 1895 in Massachusetts, served during WWI and married in 1919 to Elizabeth b. 1901 in Ohio. They had three girls; Jane b. 1921, Barbara b. 1922 and Nancy b. 1924. Paul Rice was a friend of Billy Wood Jr. and was the only survivor of the automobile accident that took the lives of William M. Wood Jr. and David Alexander Gardner in Reading, MA on Aug. 15, 1922. Paul was riding in the back seat of the Rolls Royce sedan driven by Billy Wood Jr. and was thrown from the car. His testimony to authorities was crucial to the investigation as to the cause of the accident. Paul continued his employment with the American Woolen Company and lived in Shawsheen Village for 17 years. He was involved with establishing Boy Scouts in Andover and became the first Scoutmaster of the Troop in Shawsheen. Paul & Elizabeth Rice moved to Cohasset, MA and sold the home to Rachael D. Eastman and husband Weston F. Eastman on Oct. 10, 1940. It is interesting to note that when Paul Rice died on Mar. 15, 1956 in Cohasset, he was interred at the West Parish Garden Cemetery, in a lot close by the Wood family lot. Weston F. Eastman owned a real estate and insurance company in the Bay State Building in Lawrence. Weston F. & Rachel son Weston D. Eastman and his wife Harriet would later acquire the home in Feb. 1, 1974. The Eastman family owned the home for 67 years selling in 2007. Rachael D. Eastman estate, Weston D. Eastman, Extr.